With the new year comes new resolutions, and the most common resolution people make is related to their health. I am also looking forward to a fitter and healthier 2017, so to help hold myself accountable I will be using the new mini Fitness Happy Planner! In this post, I am sharing how I prepped my fitness planner so that I was ready to hit the ground running with it on January 2nd! Anytime I am starting a new Happy Planner, the first thing I do is add my name to the title page. For this planner, I decided to try my hand at brush lettering my name. I used a Pentel Sign Pen with a brush tip to write out my name, and I love how it turned out. It adds the perfect personal touch to this planner. 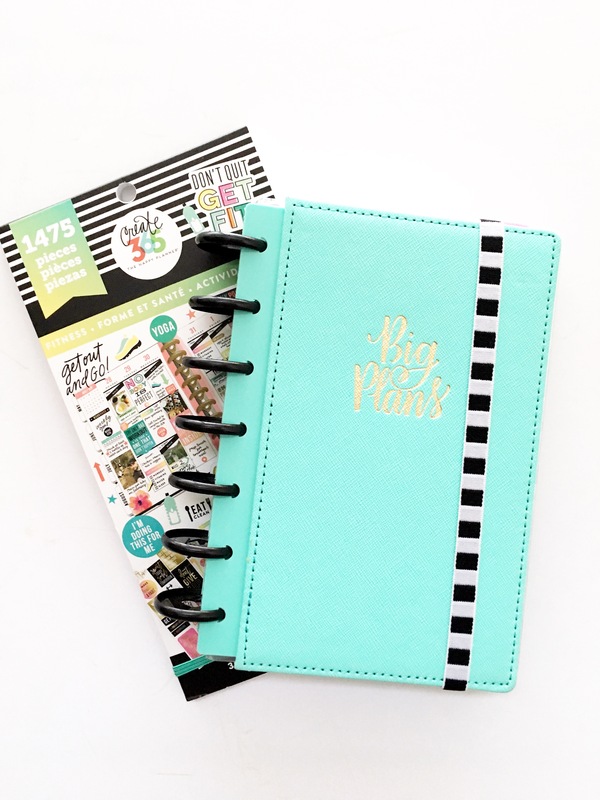 mambi just released a Fitness Sticker Pack in their latest release, and it’s the perfect partner to this planner. The January divider is simple with colorful stripes, but I decided to add this quote to the divider. “Workout because you love your body, not because you hate it.” I thought this was the perfect quote to kick off the year in this fitness journey. I hope that it will remind me daily that I’m working out because I love myself. Hopefully it will help making those gym visits a little more fun! I was inspired by my fellow Design Team Member Gretchen to create a goals page using the mini pocket page protectors. (She wrote about how she set hers up on the mambi blog.) I used stickers from the fitness sticker pack to help decorate the pages, and I wrote out my goals for the month. I love this idea and plan to do it every month since I plan to have my goals change each month. Since this is a mini planner, there isn’t as much space to really decorate the monthly. Therefore I decided to just write my monthly goals on the bottom right corner as well. I also included the “Don’t Quit” sticker. I know that the first month back in the gym will be the toughest, but I want to be motivated and not quit. I am loving the combo of the mini Fitness planner and the fitness sticker pack. Are you using the mini fitness planner in 2017? I’d love to see how you are using yours! Let’s make 2017 our fittest and healthiest year yet! I have the medium size fitness planner and am in love with it too! Don’t you love all the stickers in the fitness pack? I love how you decorated yours I might steal some ideas 🙂 Good luck with your goals! I need your guidance and expertise. I’m a Foundation Administrator. I plan two charity events a year. I wondered if you had any suggestions for me as to which Happy Planner would best work for party planning.